Following the first part of this series of maps on political cyberscapes, we now turn to mapping the keywords "capitalism", "communism" and "socialism" as they appear in Google Maps placemarks. The goal of this analysis is to see whether or not these references correspond to the world's political economic realities in the same way that previous maps of online references were closely tied to the offline world. References to "capitalism" in Google Maps placemarks correspond closely to our expectations. Although most countries could be classified as capitalist (of one degree or another), the term is most closely associated with the capitalist countries of North American and western Europe. 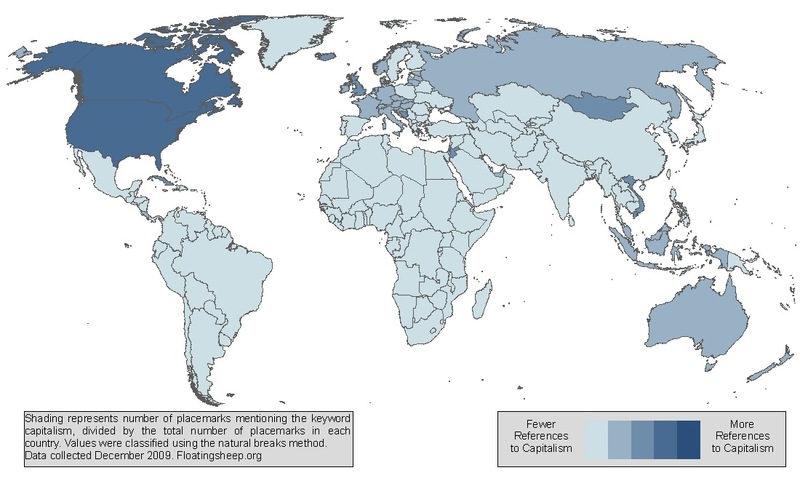 The highest relative concentration of references to capitalism exists in both the United States and Canada, with most of the European Union coming in with slightly fewer references. Interesting, however, is that other successful capitalist countries, like Japan and Australia, do not score highly with this measure. The places with the highest concentrations of references to "socialism" are, like references to "capitalism" and "communism", mostly what one would expect; Cuba, Libya, Turkmenistan, Uzbekistan, Tajikistan, Sri Lanka, Laos, and Vietnam all score highly in this measure. Likewise, within the South American region, Venezuela (home to the outspoken and left-leaning Hugo Chavez) exhibits the most relative references to socialism. Interestingly the distribution of references to socialism is more dispersed than references to communism which corresponds to the offline situation as well. The relatively high number of references to "socialism" within the U.S. is a bit perplexing, as the U.S. has a long history of anti-socialist rhetoric. Although we do not know the specific context of each of these placemarks, we do note that over the past two years, the policy programs (e.g., health care) of the Obama administration have been heavily (and incorrectly) critiqued by the right wing as being socialist. It seems likely then that some of these references may be associated, albeit in a negative manner, with President Obama and his policies. Your work is amazing, with regard to the map of communism, I guess the appearance of countries like Saudi Arabia in a darker shade, reflects that such maps represent interest, both positive and negative, therefore the analysis of such maps should consider that matter and not just correlate the degree of references with the degree of positive interest. Excellent point! We've tried to make that qualification elsewhere with some of our maps, but tried to pay more attention to some other things with this set. But you're exactly right that the use of a particular keyword doesn't necessarily denote how it was used. Although some contextual clues can be gleaned (e.g., is a country with lots of references to "communism" actually communist? was it communist at another point in time? ), the actual way these keywords are used is a bit unknown at this point. Great work! it's just amazing how Japan and Australia scored low in terms of references. This is probably due to "capitalism's" high association with other capitalist countries that even these states are scored out.. I think, in general, in all these maps, you need to normalize against some standard of geographical references to all words (or all English words when applicable). The point is that it is likely that there are many more specific geographical references to places in areas which geographical references are generally common. @randomfish: To respond to your suggestion, we already do (that is, if I'm understanding you correctly). 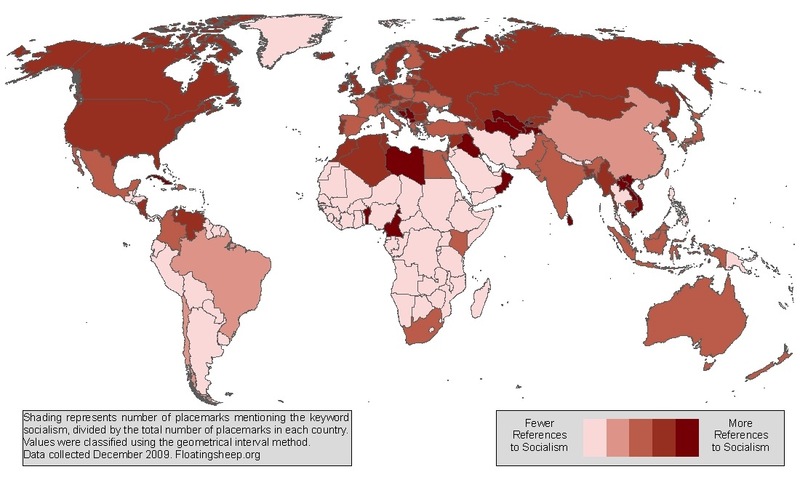 While it hasn't been the case for all of our maps posted on this blog, all maps that are aggregated to the US county, administrative or country level are normalized by the total number of placemarks (using the keyword "*" in the query) at the same level. So, in effect, these maps show the number of mentions of a particular keyword as a percentage of the total number of placemarks. Hope that clears things up!